Lotus Light Charity Society” (LLCS) is an international charitable organisation founded in 1993 by Buddhist monk Grand master Lu. The organisation used the umbrella, one of the symbols of Buddhism, to help people living in Hong Kong become aware of the difficulty of collecting rainwater in Northwest China. 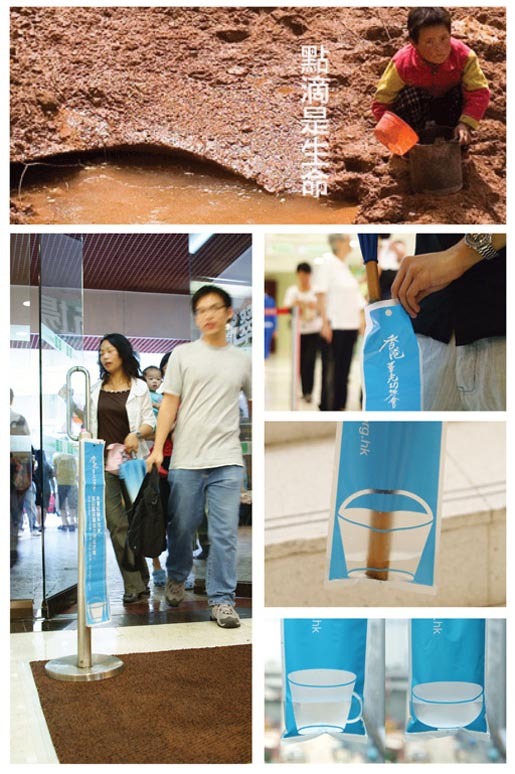 Grey Hong Kong created umbrella bags with pictures of bucket, glass and bowl at the bottom and placed them in shopping malls, where people might donate more. As rainwater was filling up umbrella bags, shoppers got the message that drops of rainwater could quench the drought in Northwest China. Donations increased enough to build more than 5,300 water cellars in 2009, benefitting over 20,000 people. Messages on the Umbrella Bags: “Bucket” It takes half a day for people living in China’s arid regions to get this amount of clean water. “Cup” People living in China’s arid regions call this pure water. “Bowl” In China’s arid regions, a child gets less water than this in a day. Donations were received at www.llcs.org.hk. 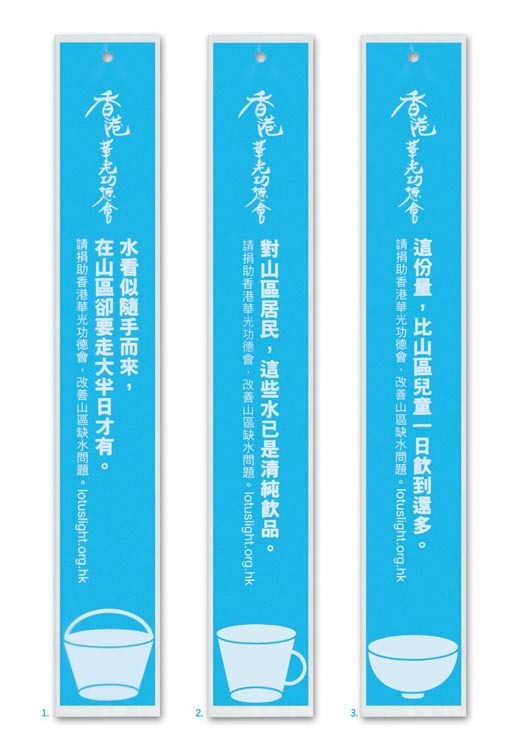 The Umbrella Bag campaign was developed at Grey Hong Kong by creative director Keith Ho, creative director/art director Ray Lam, creative director/copywriter Keith Lo, art director Cliff Luk, copywriters Joshua Wong and Tony Chan.